From the Nobel Prize-winning Icelandic author, a magnificent, epic novel—"funny, clever, sardonic and brilliant" (Annie Proulx)—at last available to contemporary American readers. Set in the early twentieth century, Independent People recalls both Iceland's medieval epics and such classics as Sigrid Undset's Kristin Lavransdatter. If Bjartur of Summerhouses, the book's protagonist, is an ordinary sheep farmer, his flinty determination to achieve independence is genuinely heroic and, at the same time, terrifying and bleakly comic. 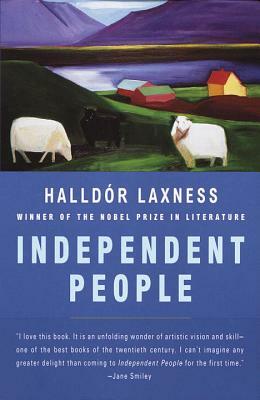 Halldór Laxness was born near Reykjavik, Iceland, in 1902. His first novel was published when he was seventeen. The undisputed master of contemporary Icelandic fiction and one of the outstanding novelists of the century, he has written more than sixty books, including novels short stories, essays, poems, plays and memoirs. In 1955 he was awarded the Nobel Prize for Literature. He died in 1998.